The fight never ceased from either side. At no time did the sense of desperation subside. Whether Sunset or Lakeridge moved into the Class 6A girls basketball playoff field boiled down to one half of basketball. With the game knotted up at halftime after two quarters of hand-to-hand combat and both teams battling to keep their seasons afloat, Saturday's Play-In game wasn't about who wanted it most, but who could execute in the heat of chaos. 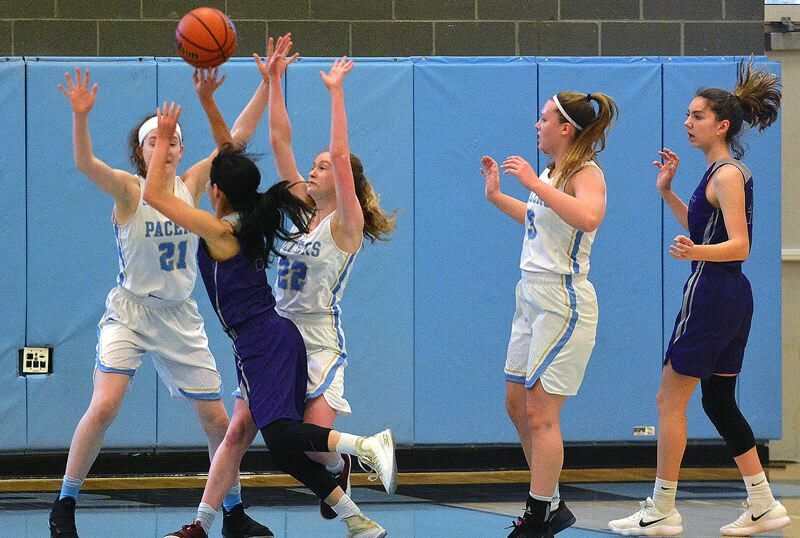 And with its season on the line, Sunset put together perhaps its best quarter this year, opening up a nine-point lead in the third period on its way to a 55-43 win over the Pacers at Lakeridge High School on Saturday. Despite the season-ending defeat, this year marked a major step forward for the Pacers. Under first-year coach Jason Brown, they snapped a 23-game losing streak that started in 2016-17, snapped a 53-game Three Rivers League losing streak that dated back to 2013-14, and put into the rear view mirror a three-year stretch that had seen the team go just 7-62 overall. This year's Pacers — including seniors Laura Barton, Maddie Grimes, Kathryn LeMoine, Sierra Zevenbergen, Savannah Karagounis, Jenny Li and Anna Garrison — ended their season in seventh place in the TRL at 5-11 and 11-14 overall. "Those seven seniors are a huge part of what we're doing and to see it end after finally finding success for them is tough," Brown said. "But I'm really proud of this team. There wasn't one game this season where we quit. In years' past, that was kind of the M.O. They'd get down pretty far and almost give up. We made a commitment that wasn't going to happen this year and they upheld it big-time." That said, the young Apollos — led by senior guards Kendsy Carmichael and Delaney Ragan — found a way to win on the road. "This shows how much we've grown this season," Carmichael said. "We keep stepping up and that's awesome. I'm super excited to go into the playoffs and see how it's all going to play out. I'm excited to have another game, for sure." The No. 31 Apollos moved to 8-16 overall with the win and advanced to face No. 2 Tigard in Tuesday's first round of the Class 6A state playoffs. After the first half ended in a 25-25 tie and featured 10 lead changes, Sunset's sense of urgency in the second half seemed to go up another level. "We were being aggressive and attacking the basket pretty well, which we struggle with sometimes against bigger, physical teams," Brown said, noting that both had success attacking the basket. "(Sunset) wasn't as physically imposing as we're used to, but they were quick and pretty aggressive pushing us off the ball a little bit. But we tried to attack and I love the fact that we never stopped fighting and kept competing." On the other end, Carmichael, Ragan and junior Vanessa Lopez were superb for the Apollos, combining for 11 points and four assists in the third while providing seasoned ball handling and decision making. "Throughout this season Vanessa, Delaney and I have all built this really strong chemistry together," Carmichael said. "We were patient, took the shots we knew we could hit and it ended up working out well in our favor." Led by that trio, the Apollos put together a 17-8 edge in the third, highlighting that run with a baseline jumpshot from freshman Haley Bennett and a late Carmichael 3-pointer that provided a 42-33 lead heading into the final frame. Bennett and Oby Nwokoma played pivotal roles in Sunset's second-half upswing. Each freshman scored four points apiece in the third while grabbing a pair of offensive boards. Bennett pounced on another Pacer miss and laid it home to start the fourth to give Sunset a 44-33 lead. "They totally stepped up today," Carmichael said. "They played their hearts out and being a freshman coming into this game, that can be so stressful. They did awesome. Everyone stepped up and played for each other. Everyone was selfless for sure." Lakeridge started the fourth on a 5-0 run, thanks in large part to its full-court pressure that set up Barton for a score that made it 44-38 with 5:05 to go. Lakeridge was still down just six following a Grimes layin that made it 46-40 and a Barton free throw for 49-43 with just over two minutes left to play. But the Apollos put the game away at the free throw line down the stretch, going 6 of 6 the rest of the way to expand their lead back out to double figures. Grimes had a team-high 14 points while Barton chipped in 13 and junior Brooke Clinton added six. Ragan had a game-high 15 for Sunset and Carmichael added 12. "The legacy (the seniors) leave behind is huge," Brown said. "We had a majority of our JV team here. There were a ton of youth (players) here. They all see what we're building and they're a part of it. Granted, you never want to lose, but to come back after the seasons they've had the past three years and win 11 games and five league games having never won a league game is huge."